The state of California offers several programs to protect the environment, preserve natural resources, offer recreation options to the public and reduce the risk of floods. To pay for these type of programs, the state uses bonds, money from fees and money from the state’s General Fund. In recent years, the state has spent about $5 billion each year to support these types of programs. Repaying the bonds would cost the state about $200 million each year for the next 40 years. The measure could save local governments tens of millions of dollars each year. All Californians deserve access to clean drinking water and safe local parks. Prop 68 helps protect California’s air quality and places where families hike, camp, swim and play. Not enough money from Prop 68 will go to improving parks. California does not need more debt. 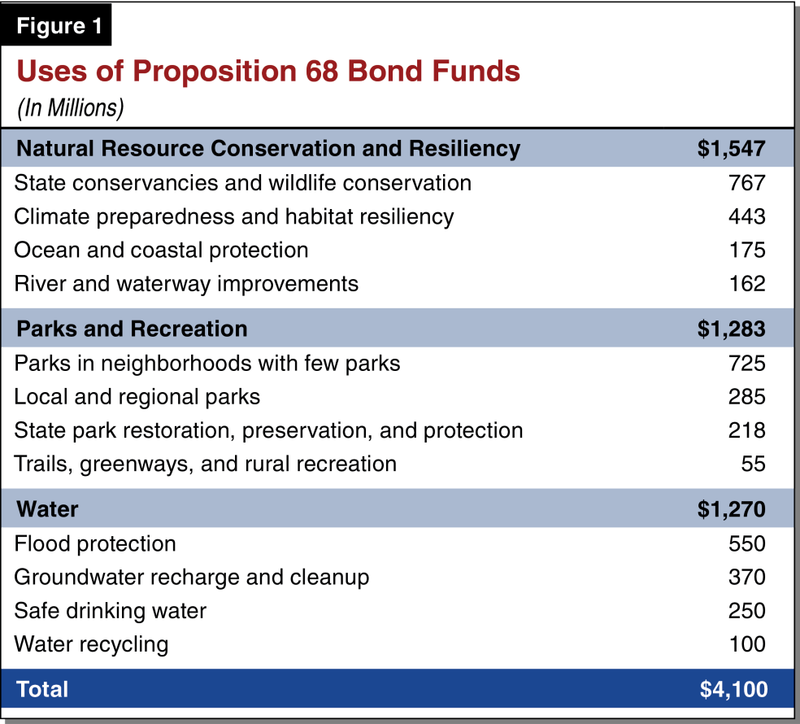 Should the State sell $4.1 billion in bonds to fund parks, natural resources protection, climate adaptation, water quality and supply, and flood protection? California operates programs to protect the environment, conserve natural resources, prevent floods, ensure safe drinking water, other water related programs, and parks. The State also provides grants and loans to local governments and other organizations for similar programs. Almost $5 billion each year is spent on such programs. The money comes from a combination of the sale of general obligation bonds issued by the State, revenue generated by fees, and the State’s General Fund, which is the state’s main operating fund. During the past 17 years voters approved almost $27 billion in general obligation bonds for various natural resources projects, of which the State still has almost $9 billion available. Most of that money is available for water quality, supply and infrastructure purposes authorized by Proposition 1 in 2014. General obligation bonds are sold to investors and are paid off from the State’s General Fund. The State repays the principal and interest over time, often several decades. This proposition will allow the State to sell $4.1 billion in bonds. The amount includes $4 billion new bonds and $100 million previously authorized, but unsold bonds. The proposition provides funding to state departments and local agencies for specific natural resources related purposes. The money is designated for a wide range of projects across the State including: natural resource and wildlife conservation; climate preparedness to address the effects of climate change; ocean, coastal, and river improvements; maintenance of and creation of parks and recreation projects; and water quality and groundwater preservation projects. Proposition 68 requires at least 15%-20% of the funds for each use specified for use in “disadvantaged communities.” Local governments will be affected by this proposition because they can use bond money by agreeing to cost sharing to pay for projects. Repaying the bonds is expected to cost an estimated $200 million each year for 40 years, resulting in a total cost of $7.8 billion. There may be savings to local governments in tens of millions of dollars because the bond money available will relieve the local governments from paying for all of a project. There are unknown costs and savings associated with the actual operation and impacts of the projects produced. Prop 68 is an investment to safeguard water quality and to protect natural resources in uncertain environmental conditions. Prop 68 brings safe drinking water and parks for communities in need. Not enough money is actually dedicated to improving parks in all parts of the state. California has enough debt and does not need to add to it by having to pay for a new bond measure. Increased state bond repayment costs averaging about $200 million annually over the next 40 years. Savings to local governments, likely averaging several tens of millions of dollars annually over the next few decades. Natural Resource Conservation. The state provides funds to purchase, protect, and improve natural areas—including wilderness and open-space areas; forests; wildlife habitats; rivers, lakes, and streams; and coastal habitats. State conservation programs often are administered by state conservancies and other departments. These programs often provide grants to local governments or other organizations that carry out projects. State and Local Parks. The state operates the state park system, which includes 280 parks. Additionally, the state provides funds to local governments to purchase and maintain local and regional parks, trails, and other recreation areas. Flood Protection. The state funds the construction and repair of flood protection projects as part of the state’s Central Valley flood management system. This includes the repair and strengthening of levees and projects designed to divert water away from populated areas during large storms. The state also provides funds to local governments to complete similar types of projects throughout the state. Safe Drinking Water. The state makes loans and grants for local projects designed to improve access to clean drinking water. This includes projects to install equipment that remove unhealthy pollutants from local water supplies. Other Water-Related Projects. The state provides funds for various other projects throughout the state that improve water quality or the reliability of water supplies. For example, the state provides loans and grants to local agencies to construct water recycling and reuse projects, store more water underground (referred to as “groundwater recharge”), and clean up polluted groundwater. Past Bond Funding for Natural Resources Programs. Since 2000, voters have authorized about $27 billion in GO bonds in statewide elections to fund various natural resources projects. Of this amount, approximately $9 billion remained available for new projects as of June 2017. (Most of the bond funds still available are for water-related purposes authorized by Proposition 1, which was approved in 2014.) The state repays GO bonds over time, with interest, using the state’s General Fund. $4.1 Billion GO Bond for Natural Resources Programs. This proposition allows the state to sell a total of $4.1 billion in GO bonds for various natural resources-related programs. This total includes $4 billion in new bonds. It also includes a redirection of $100 million in unsold bonds that voters previously approved for specific natural resources uses. Bond Funds Specific Purposes. This proposition provides funding for various state departments and local governments to use for specific natural resources-related purposes, which are summarized in Figure 1. This includes $1.5 billion for a variety of programs generally intended to conserve natural habitats; improve coastal, river, and other ecosystems; and increase the resiliency of the environment to withstand the effects of climate change (such as sea level rise and more frequent droughts and forest fires). The bond also provides $1.3 billion for parks and recreation projects, most of which would be used to build or improve local parks. Lastly, the bond provides $1.3 billion for various water-related projects, including to increase flood protection, recharge and clean up groundwater, and provide safe drinking water. Administrative Provisions. This proposition includes a number of provisions designed to control how the bond funds are administered and overseen by state agencies. The proposition requires regular public reporting of how the bond funds have been spent, as well as authorizes financial audits by state oversight agencies. In addition, for several of the programs funded by this bond, recipients—mostly local governments—would only be eligible to receive the funding if they provide some funding to support the projects. This local cost-share requirement, where it applies, is at least 20 percent of the bond funding awarded. As an example, a city receiving a $100,000 grant to build a new park trail would need to provide at least $20,000 towards the project. The proposition also includes several provisions designed to assist “disadvantaged communities” and very disadvantaged communities (generally, communities with lower average incomes). For example, the local cost-share requirement would not apply to most of the grants provided to these communities. In addition, the proposition requires that for each use specified in the bond, at least 15 percent of the funds benefit very disadvantaged communities. State Bond Costs. This proposition would allow the state to borrow $4 billion by selling additional GO bonds to investors, who would be repaid with interest using the state’s General Fund tax revenues. The cost to the state of repaying these new bonds would depend on various factors—such as the interest rates in effect at the time they are sold, the timing of bond sales, and the time period over which they are repaid. We estimate that the cost to taxpayers to repay this bond would total $7.8 billion to pay off both principal ($4.0 billion) and interest ($3.8 billion). This would result in average repayment costs of about $200 million annually over the next 40 years. This amount is about one-fifth of a percent of the state’s current General Fund budget. Local Costs and Savings to Complete Projects. Much of the bond funding would be used for local government projects. Providing state bond funds for local projects would affect how much local funding is spent on these projects. In many cases, the availability of state bonds could reduce local spending. For example, this would occur in cases where the state bond funds replaced monies that local governments would have spent on projects anyway. In some cases, however, state bond funds could increase total spending on projects by local governments. For example, the availability of bond funds might encourage some local governments to build additional or substantially larger projects than they would otherwise. For some of these projects—such as when the bond requires a local cost share—local governments would bear some of the additional costs. On balance, we estimate that this proposition would result in savings to local governments to complete the projects funded by this bond. These savings could average several tens of millions of dollars annually over the next few decades. The exact amount would vary depending on the specific projects undertaken by local governments, how much local cost sharing is required by state agencies, and the amount of additional funding local governments provide to support the projects. Other State and Local Fiscal Effects. There could be other state and local fiscal effects under this bond. For example, costs could increase to operate and maintain newly built parks. On the other hand, some projects could reduce future costs, such as by making levee repairs that reduce future flooding damage. The amount of these possible fiscal effects is unknown but could be significant. A YES vote on this measure means: The state could sell $4.1 billion in general obligation bonds to fund various natural resources-related programs such as for habitat conservation, parks, and water-related projects. A NO vote on this measure means: The state could not sell $4.1 billion in general obligation bonds to fund various natural resources-related programs. California faces more frequent and severe droughts, wildfires, unhealthy air, unpredictable weather, and reduced federal funding and support for our land, coast, and water. YES on 68 protects California’s unique resources and helps ensure all Californians have access to clean, safe drinking water and parks. PROTECTS DRINKING WATER QUALITY YES on 68 protects and improves California’s water quality by keeping toxic pollutants out of our water sources and cleans contaminated waters. “YES on 68 is a smart investment in California’s future by protecting our water supplies from pollution and helping local communities adapt in uncertain times. These investments are critical for today’s residents and future generations,” Tim Quinn, Association of California Water Agencies. Several California communities have water so contaminated that residents cannot turn on the tap and drink the water in their own homes. In many places, families lack access to safe local parks. YES on 68 cleans up severely contaminated local water supplies and makes long-overdue investments in local parks where they are needed most. “All children should have safe places to play and access to clean air and water. YES on 68.” Dr. Richard Jackson, M.D., Professor Emeritus, UCLA Fielding School of Public Health. YES on 68 protects rivers, lakes, streams, and natural areas that are critical sources of our clean drinking water and beautiful places where families hike, camp, swim, and play. YES on 68 ensures funds will be efficiently used for intended purposes by requiring annual independent audits and by establishing a citizen advisory committee to review expenditures. Prop. 68 was placed on the ballot with bipartisan support, and is endorsed by groups that understand the importance of a YES vote to improve public health and protect California’s clean water for our health, economy, children and families. Don’t be fooled by Proposition 68. The proposition promises to protect and improve California’s parks. The truth is it doesn’t. First, of the $4 billion dollar bond, only $1.3 billion is actually dedicated to improving parks. A lot of the remaining money is given to politicians to spend on their pet projects. Second, the money is not distributed fairly and equally across the state. Many of our residents in inland and rural California will not see any Prop. 68 park bond money spent to fix and improve their local state parks. This is wrong. Every Californian should have their local park improved, not just the few who live near parks of powerful politicians. Third, estimates are that state parks require $1.2 billion dollars for deferred maintenance. Yet, Prop. 68 allocates only a small amount of money for this essential task. Finally, the Department of Parks and Recreation can’t be trusted with the money. In 2012, the department threatened to close 70 parks, saying it didn’t have the money to keep them open. This was false. An audit discovered the department did have the money, but was hiding it from the public. Until the department is reformed, we can’t trust it to spend the money wisely and fairly. We need to protect and improve our state parks, but Prop. 68 is the wrong way to do that. Vote No and make the State Legislature really fix the parks for all Californians. Isn’t it wonderful how many great projects that California can build? I’m not here to tell you that addressing drought, water, parks, climate, coastal protection, and outdoor access is wrong. What I want to tell you is that borrowing for them is wrong. California has enough debt. In fact, it has the worst balance sheet of all 50 states. Its unrestricted net deficit is a quarter trillion dollars! The last thing the State of California needs is more debt! Bond measures are deceptive. You think you’re voting for something good. But, it will take approximately $8 billion to pay off the $4 billion of borrowed funds. That means you can expect a tax increase. And your children can expect a tax increase. And your grandchildren can expect a tax increase. Why? The $225 million a year must be paid. With a tight annual budget, where else is this money supposed to come from? The state’s pension plan contributions are rising. The retiree medical unfunded liability has just gone up $15 billion to $91.5 billion. The state’s borrowed debt for schools ($500 million per year) and, possibly, veterans ($225 million) and affordable housing ($169 million) are squeezing out other programs. Minimum wage increases alone will add $4 billion per year to the state’s budget. This will have to be paid for. And you will be asked to raise your taxes. California is not reducing its debt. Don’t be a part of this problem. Vote “No” on Proposition 68. Can we share a rather sad fact with you? California has the largest unrestricted net deficit of all the 50 states in the nation! Do you really want to add to the debt burden of this state? Do you know that the annual payments for principal and interest on this bond will squeeze out other services that Sacramento should be providing? Like helping the homeless and assisting the mentally ill? When will Sacramento’s legislature realize that we have poor infrastructure because it has not been a good steward of its financial resources. Debt is an indication of improper spending habits and inappropriate financial decisions. Stop this madness and vote “NO” on Proposition 68. • Preparing for drought—by increasing local water supplies. • Creating a healthy future for our children and grandchildren—by locating parks where kids need safe places to play and by purifying polluted local drinking water supplies. • Safeguarding our water and coast—by protecting water sources, restoring groundwater, and preventing toxic runoff. • Preventing natural disasters—by investing in flood prevention and restoring forests prone to wildfire. • Strengthening our economy—which relies on clean, reliable water supplies, secure natural resources, and robust tourism and recreation. Opponents appear not to have read the measure carefully. Prop. 68 specifically funds parks in every California city and county. And 68 takes a comprehensive approach to California’s resources— protecting water supplies, forests, and farmland. Proposition 68 requires annual audits to make sure funds are spent efficiently for intended purposes, and it does NOT raise taxes. Business leaders, conservation groups, public health experts, and local leaders agree—Yes on 68 is smart, cost effective, and accountable.